"Essentially a well-travelled telecoms engineer, who happens to be in the Army – you install and maintain every piece of cable the Army lays globally." 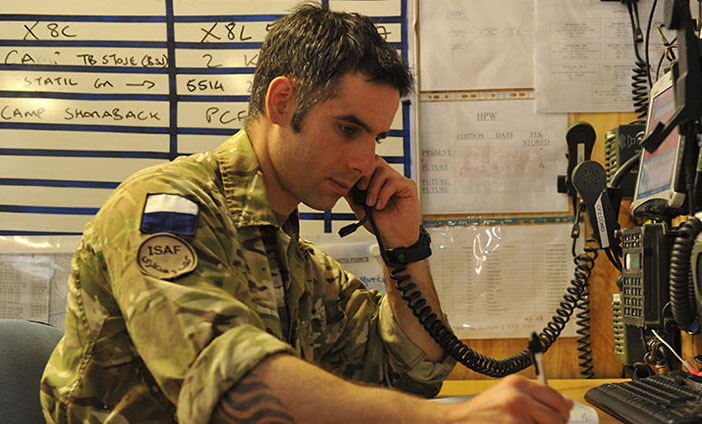 To stay in touch and support a variety of operations and communications equipment, the Army relies on its telephone and fibre optic network stretching globally between different theatres of operations and standing UK commitments abroad. You will be trained to install and maintain these networks – whether the cables are housed in tunnels or at height, to the battle-proof standard required by the military. You’ll get great technical training and learn about copper and fibre optic cables, local area networks, CCTV and video conferencing. You could earn professional trade status and also qualify to become an Aerial Rigger. Get trained in the technical skills you need to install, service and repair telephone exchanges and fibre optic networks. Work with CCTV and video conferencing technology. Learn how to drive and operate the vehicles that the communications equipment is transported in, from Land Rovers up to HGVs. Enjoy continuous professional development that will make you highly employable if you return to civilian life. Get real responsibility straight out of training. "Mainly working in small surge teams of highly qualified technicians, a large amount of independence and trust is given to installation technicians as they deploy globally. Without doubt the most well travelled trade in the Corps, I have been to the Falkland Islands, the Ascension islands, Cyprus and Kenya, all while building up accreditation towards professional trade status. On Operations, we are a highly sought after resource as the cabled link between headquarters and frontline camps is one of the most important as it underpins the Army’s technological reach in to the battlefield. " You will enter this role with at least one of the three key skills (copper, fibre, structured cabling) gained from either previous Regular service or industry. Certain courses at the Royal School of Signals attract a City & Guilds award. "My job lets me deploy with my regular counterparts, use the skills I've picked up in my civvy job and develop myself further. I normally go on tasks with a small team, maybe six other people. I've been all over the world - the Falklands, Cyprus, Brunei and Kenya. The training is great too - I've just done a course on structured network cabling and my civvy boss is interested in using me on a new project at work as a result."